One of the things that led me to book blogging was a desire to always be talking about books. I would start unsolicited conversations in book stores and restaurant and tire out my family and friends with talk about what I was currently reading, what I was really looking forward to, which book I tossed across the floor in frustration. Turning to blogging gave me a microphone and a stage to share all things books with those who also love to read. So I’m happy to lend my space to others now and then so that they can tell you about books that they really enjoyed and would recommend. 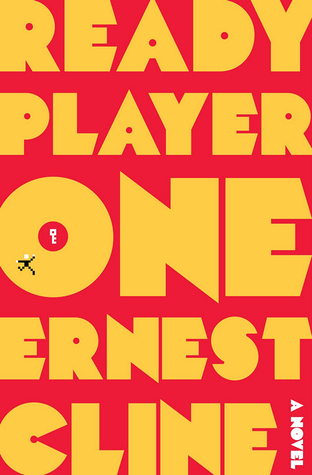 Today, my friend Rick Ludwig is here to review Ready Player One by Ernest Cline. Take it away, Rick! Fan fiction has been around for a long time, but growth exploded since the advent of networked computers (yes, even pre-internet). From a literary perspective, fan fiction tends to be of slightly higher value than the dirty limerick written on the bathroom stall. The worst of these tend to come in two forms: the “’Shippers” and the “Crossover”. “Shipper” fan fiction takes characters from a given work (say Star Trek) and forces them together, most often with little to no relation to their actual given character traits (Spock only needs it once every seven years… get your facts straight!). “Crossovers” take two separate media bits and, again, forcing them together unnaturally (see a pattern?). For some reason, The Doctor (from Doctor Who) needs to help Captain Picard (Star Trek: The Next Generation) fight an alliance between the Borg (Star Trek: The Next Generation) and the Empire (Star Wars). Yep, it makes no sense. Of course, with fan fiction, it doesn’t need to make sense. The point is pure enjoyment of the reader (and the writer) and to heck with any literary aspirations. So, why mention this in a review for Ready Player One? Well, Ready Player One shares some of the roots of fan fiction, and you get some of the same nerdy excitement reading the novel as when you read about Agent Mulder (The X-Files) working on a case with Agent Cooper (Twin Peaks). There’s a lot more to Ready Player One than just trying to please a fan base though. At the heart of fan fiction is a desire to remake the world in your own image and that’s what Ready Player One deals with. The novel centers around a massive, online virtual system called OASIS. Don’t think of it as a video game, think of it as a possible evolution of the internet (though the book focuses more on the game elements, they make it clear that there’s a lot more to it). Set in the near future (40ish years out), the world is in a terrible state and most of society escapes into the virtual world of OASIS as an alternative to their terrible real life. It’s not just entertainment though. Just like the internet today, people do everything in this virtual online environment from business to romantic relationships, to exercise. All of the interaction is accomplished through the use of visors and feedback suits that allow users to experience all of the sensations, including sight, sound, touch and even smell (or as much as they can afford – some people only have the visor and gloves). The creator of this world is, of course, massively wealthy. When he dies, he decides to leave all of his money, as well as control of his company and the online world, to whom ever can find the hidden Easter Egg. The main characters of the novel are ‘gunters’ (short for ‘egg hunter’) – people who spend all of their time trying to find the egg. The egg is hidden and will only be revealed by playing a game. The game involves finding three keys, each key unlocking a gate. An initial clue is revealed to all OASIS users and additional clues are given when a key is collected and a gate opened and passed. By itself, this would make a fairly cleaver novel, but Cline Earnest adds a whole new level to the book – and this is what really makes the book stand out. Inside everybody there is a core of nostalgia. To what degree this is accepted or acknowledged varies from person to person, but Geek Culture seems to have taken this to an extreme (this isn’t derogatory, by the way – I proudly consider myself a part of said culture). Springing from this is a love of references to their favorite things, the more obscure the better. When Seven of Nine references the flight of the Phoenix on Star Trek: Voyager, fans squealed in delight at the reference to the Star Trek First Contact movie. Given this, it’s not surprising to find some throw-away references to geek favorites sprinkled lightly into Science Fiction and Fantasy works – usually in the form of an Easter Egg (like the RD-D2/C3P0 hieroglyphic in the Well of Souls that contained the Ark of the Covenant in Raiders of the Lost Ark). An ‘Easter Egg’ is an inside joke, usually too small to be noticed, and usually put there by an overworked and underpaid creative staff. Easter Eggs are hidden in all kinds of areas from Movie and TV to Software, works of art and beyond. You can probably find an Easter Egg in just about any field. Earnest takes this idea and runs with it. Ready Player One has probably the greatest collection of references to Geek Culture ever seen by popular culture, possibly on-par with the San Diego Comic Con. The ingenious part though, isn’t the references themselves, but how they’re integrated into the plot of the book. The three keys can each be found by deciphering a clue in the form of a quatrain. Riddles that test the player knowledge of, and dedication to, pop culture. The creator of OASIS, like many geeks, had been obsessed with pop culture, especially that of the 1980s. Science Fiction, Fantasy, Games (video and table), music – anything is fair play. What’s really interesting is the effect this has on culture in the book. Of course, anybody who grew up in the 1980s would be obsessed with these things, but it manages to spark an entire new generation worth of obsession with nostalgia that many of these characters were experiencing for the first time because of the game. This novel brings up a lot of the questions that cyberpunk novels address (most of which are not new, but redresses of age old questions asked in literature since the beginning). The one that takes center stage is the question of what is real. Is what we experience in a digital space still “real”? Can we really fall in love with someone over the internet, having never before met them? What is the value of a digital item vs. a physical item? The main character falls in love with a challenger – but the question is raised who he fell in love with, the online persona or the real person. The online persona is a reflection of the real person, but in a digital environment we can be who, or what, we want to be. A short, weak, heavyset man can become a tall, strong, physically fit woman – in part, our digital persona can be more “real” than our physical self. The digital persona is a manifestation of all of our own personal issues corrected for a digital environment. In fact, there are more than a few surprises that deal with this issue. So, even if someone falls in love with our digital persona, aren’t they still falling in love with us? Their character is a manifestation of who we are, or, at least, who we want to project who we are. At its core, civilization has retreated into OASIS because of the condition of the real world. OASIS was created as the real world, but able to be made into whatever one wants and desires. Obviously they can’t describe all of OASIS, but what we do see and hear about brings around a really interesting point – our own lack of creativity. There’s an emphasis in the book about everything being code – people can code their own clothes, buildings, and even planets – but what is the pervasive element within OASIS? Ships, gear, and planets based on something someone else created. The main characters all have ships from pop-culture shows: An X-wing, a ship from Firefly, the DeLorian from Back to the Future… all based on someone else’s creation. The OASIS described in the book shows a somewhat lack of creativity. Now, I’m not going to say that, given the chance, I wouldn’t want to cruise around in one of my favorite ships, or use that really cool weapon from my favorite game, but it clearly shows a civilization on the downfall – one where everything is based on something else. At first, I wondered why, if so many people are obsessed with this game, it would take so long to decipher the clues left behind. In today’s world, there’s very few mysteries that multiple people haven’t jumped on to try and solve – and most of these have very little reward beyond fame for solving it – throw in a couple billion dollars as a reward and it would be cracked within weeks. No, this game is testing people’s creativity for the first time. They’re used to going on adventures where it’s based on a movie or TV show they’ve seen a million times – just playing through. The main character is somewhat more creative than the other characters, but still seems somewhat slow on the uptake. He has to be clever to survive, but when he’s handed fame and fortune (and love) the book explores the effects. It’s his desire to resume his pursuit of his love interest that inspires his creativity for the final solution, which completely astounds the other characters. We’ve heard it before, but creativity is the economy of the future and Ready Player One shows us what happens when that currency fails (and succeeds). If you can’t tell, I enjoyed the heck out of this book – it was an enormous amount of fun! This is the Earnest Cline’s first book, and I hope he’s hard at work on his next one. This could have easily been a dull book that dumps pop-culture references in by the truck load to appease its audience, but Cline took the more difficult route to write a book that challenges us to really think about who we are, what we do, and what we consider to be real. While I probably wouldn’t recommend this book to everyone, it’s a must read for any geek, nerd, or nostalgia fan.